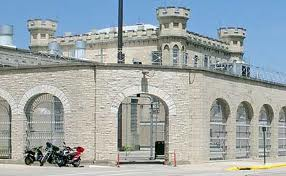 My story of preaching at Waupun Correctional Institution Chapel this past Saturday begins here. Chapel at the prison is electrifying. That’s the word for it. Reminds me of Johnny Cash’s classic live album, “At Folsom Prison,” except with Jesus. There’s a saying that goes, “You may never know that Jesus is all you need, until Jesus is all you have” and the men walking into chapel on Saturday had Jesus and not much else. I was thinking about that as I sat down near the front and watched the guys come in. There was James, a guy who attended my study for 5 or so years, and I would guess is one of the godliest men I’ve ever met. He’s about 35, has another 12 years or so on his sentence. I don’t know what he did – I never ask the guys – but I’ve thought he would make a great pastor on our staff. Of course, I’ve never mentioned that to him. If my misty memory serves me correctly, James is one of the many men who have testified that prison is the best thing that ever happened to him. And by the way, in all my years of doing prison ministry, I have never heard a guy proclaim his innocence. I’m sure many prisoners do, but most of the guys I minister to seem to feel that for the most part, they have gotten what they deserved. And I saw Luegene, who appeared really glad to see me. He once told me about stealing 20 bucks as a little boy and then feeling guilty about it. So he did the only right thing you can do with a guilty conscience and a 20 spot burning in your pocket – he flushed it down the toilet to “give it back to God.” You’ve got to hear him tell the story, though. Your sides will split from laughing so hard. The gospel I preach has brought me to a rock – solid conviction that I believe makes prison ministry possible: “None is righteous, no, not one; no one understands; no one seeks for God. All have turned aside; together they have become worthless; no one does good, not even one.” Romans 3:10-12 (ESV) I cannot, therefore, sit in judgment of these men, for I know my own heart. I have never taken a man’s life…except perhaps that is, in the darkness of my own imagination, as Jesus said that anger and hatred make me an accessory to the crime of murder. First, second, third or fourth degree murder – what does it matter? I’m guilty, and so are they. Our only hope is mercy. And our only hope for mercy is a substitute, Someone to serve the sentence for us. Three years ago, I began visiting and sharing the gospel with a man in a hospice in Fond du Lac. This man told his son about our church; the son started attending, and along the way, came to faith in Christ. The son’s name was Mike – he was the warden at the Walls. Now, Mike is a wonderful friend who is serving the Lord alongside the rest of us. I baptized him a couple of months ago. Prisoners, wardens and pastors…the ground is truly level at the foot of the cross. Part 3, the final installment, is here. Amen to your last statement . . . I remember hearing it years ago – how good it is to be reminded of our commonality in sinfulness and in the need for a savior – we have nothing from which to boast but in Christ alone – you are keeping us on the edge of our seats here Roger! Great post. Our only hope is mercy! Well said Pastor.